Michael Krieger serves as deputy chief information officer/G6 for the U.S. Army, where he leads implementation of the Army’s strategic direction for the network and enterprise network infrastructure. The Army CIO/G-6 oversees the branch’s $10 billion information technology investment portfolio, manages the enterprise IT architecture, establishes and enforces IT policies and directs delivery of operational IT services in C4 (command, control, communications and computers). 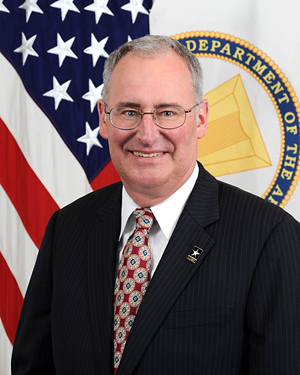 Krieger assumed his current post in July 2008 and additionally served as acting CIO from November 2009 through March 2010. The senior executive has also served as principal director for the Defense Department‘s deputy CIO and as director for information policy and integration in the office of the department’s CIO. Prior to his civilian career, he served 25 years in the Army and held operational assignments in tactical communications and command and control. Krieger holds a bachelor’s degree from the United States Military Academy and two master’s degrees, one in physics from Georgia Tech and the other in national security strategy from the National Defense University.